Europe recruits counterspy in scramble to combat NSA surveillance. 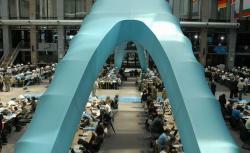 Journalists work at the press center of the Justus Lipsius building in Brussels. Are you an experienced former government spy who is looking for an exciting new career opportunity? If the answer is yes, one of Europe’s most powerful institutions may have a job for you. In a move apparently prompted by recent surveillance disclosures by former NSA contractor Edward Snowden, the Council of the European Union is looking to recruit an expert in counterespionage to root out snooping. The COEU* is one of the European Union’s two legislative chambers, charged with adopting new regulations in conjunction with the European Parliament. It is also responsible for adopting the EU’s budget, works to develop common EU foreign and security policy, and finalizes international agreements on behalf of the EU. In other words, it is a prime target for spying—and now it’s working overtime to plug any security vulnerabilities. In a vacancy posted on its website, the COEU says it is looking for someone who can provide “expertise and advice in the field of counter-espionage.” The person will be expected to “draw up a map of espionage threats to the EU’s interests” and “carry out high-level analyses” of possible spying on the institution, implementing counter-measures where necessary. But the vacancy is not open to everyone: Only citizens of EU member states can apply. All applicants will have to undergo a background check and must have at least 10 to 15 years’ experience in the field of counter-espionage with a government agency or international organization focusing on security or defence. The ad for the job expires on Sept. 27, but appears to have been posted on the council’s website in late July, a few weeks after a series of revelations concerning surveillance programs operated by the NSA and its British counterpart GCHQ. Several of the scoops have focused on how the spy agencies have secretly eavesdropped on European institutions, such as by bugging embassies and even hacking communications systems. In June, the COEU was specifically named as a possible NSA target in a Der Spiegel report. The German newspaper, citing documents leaked by Snowden, reported that the NSA was linked to an apparent attempt to infiltrate a computer network at the Justus Lipsius building in Brussels, Belgium. This building is the headquarters of the COEU and is used to hold high-level meetings attended by heads of state. In early July, an attempt by European officials’ to hold talks with the United States over the espionage was vetoed by the United Kingdom and Sweden, both close allies of the U.S. government. The lack of political consensus to hold a consultation about the spying, however, is unlikely to deter pragmatic attempts by EU institutions to throw a spanner in the NSA’s works, as is illustrated by the COEU’s recruitment of a counterespionage expert. Meanwhile, the vacancy in Europe is not the only job that has been created by Snowden’s disclosures. The NSA is recruiting a “privacy and civil liberties officer,” seemingly as part of a bid to soothe the level of public anxiety about the scope of its recently revealed mass surveillance programs. To bag the role you should be willing to question “conventional approaches,” the NSA’s ad says. But the agency doesn’t want potential recruits to shake things up too much, and it certainly doesn’t want to attract another Snowden. According to the NSA, applicants must be ready to face “unexpected obstacles”—but compliance with “established control systems and rules” is a must. *This post was updated to clarify the abbreviation used for the Council of the European Union. Future Tense is a partnership of Arizona State University, the New America Foundation, and Slate.